Whether you would like a speaker for your church event, women's group, or conference God has given me a gift, and a story to share. Thoughts about faith and hope. My blog is loaded with testimony of the faithfulness of God, including my own personal healing from breast cancer. To share the gospel of Jesus Christ so that others will know the truth and the truth will set them free. Free from sickness, disease and free to live the abundant, incredible life in Jesus Christ. To share the message of Jesus Christ's forgiveness, love and grace. To see signs and wonders follow all that believe. Connie has been blessed to find God's truth and healing that has changed her life. She is currently working on her first book about these experiences to help encourage others in their quest for love, grace, truth and healing. 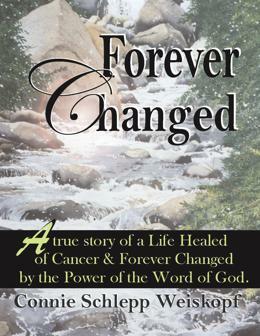 'Forever Changed' will be available in February 2012.